There are three parts to my passion and contribution to making this world a better place. Infinite Healing™, which is what this site is about, the Prime Meridian GoldZone™, and my business All About Health, Inc., which incorporates both of these amazing techniques. Infinite Healing™ is not just a new twist on the same old concepts of positive thinking, affirmations, releasing negative emotions, and letting go. Infinite Healing™ offers a new and very powerful viewpoint on HEALING. It gives you specific tools to help you learn life lessons and it provides steps for you to actually transform the negative to positive, instead of refocusing your Mind on a positive and ignoring the negative. It proposes a way for you to be proactive in TRULY HEALING your Body and your life by helping the Universe help you. The concepts of Infinite Healing™ may sound familiar, but it is undeniably a new and different approach to HEALING. The Infinite Healing™ book is dedicated to all of you who have tried so hard to be positive and still struggle; who have tried and not been able to let it go, get over it, forget about it, move on, come to terms with it, be the bigger person, forgive, or fake it ’til you make it; who seem to be continuously trying to let the same things go, get over the same event, forgive the same people, or pretend you don’t feel “that” way; and finally, for those who are ready for a fresh perspective on HEALING. Maybe this is the answer you’ve been waiting for! Author Stacie Farnham is a pioneer in the field of HONORING and HEALING the negative. 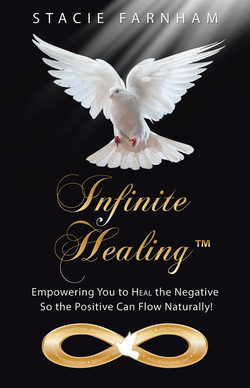 Her book, Infinite Healing™: Empowering You to HEAL the Negative So the Positive Can Flow Naturally! is packed full of information to help you learn how to HONOR everything about yourself and HEAL the things you don’t like. The Prime Meridian GoldZone™ (PMGZ) techniques via the feet, the face, and the back are non-invasive and effective ways to Harmonize the WHOLE body, utilizing the extraordinary meridian zones and signal systems in your Body. They are safe for people of all ages and encouraged for people of ﻿all professi﻿ons. These techniques are an important step for you to become an active participant in YOUR Healing! NOTE: The following links will open in a new window and will take you to the Prime Meridian GoldZone™ Services section of the All About Health, Inc. website. All About Health, Inc. provides products, services, and workshops that help you nurture Spirit, Mind, Heart, and Body. Also find information on essential oils and how to be healthier naturally! For those who are interested in how to attain better physical health, this site is for you! Visit All About Health, Inc.